Here are some of the most commonly asked questions we receive at Didgeridoo HQ, please have a read through before submitting a support request. Support requests can be lodged through the form on the Contact page. If you have a question about buying a didgeridoo make sure you take a look at the Buyers Guide section. How do I signup for subscription? Simple, visit the Signup page, choose your plan and follow the checkout prompts! Simple, just head to the Logon page at www.didgeridoodojo.com/login and use the “Forgot Password” button. Generally when the video isn’t playing the issue is your version of Adobe Flash, your browser version or browser cache issue. It could potentially be a speed issue too. 4. Do a Windows Update or System Update to ensure you’re using the latest version of your software or operating system. I want to update my credit card billing details, how do I do that? To update your billing details, log in, head to the my account page and you’ll see a section where you can do that. PAYPAL: If you paid for your subscription via Paypal then click here to follow the steps to cancel your subscription. CREDIT CARD: If you signed up for a subscription AFTER October 2013 (we put a new subscription in place then) you can click here to submit a cancellation request and the system will take care of the cancellation for you. No at this stage we don’t offer lessons via Skype because the sound quality simply isn’t good enough to be able to provide a quality lesson experience. Do you do workshops and lessons? Yes! We do regular workshops at Didgeridoo Breath in Fremantle, Western Australia. 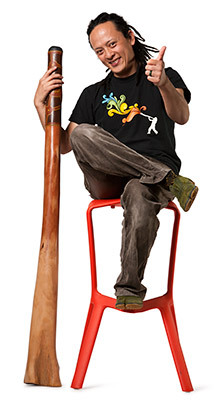 Check out the In-Store Didgeridoo Lessons to see our different workshop options. Where can I buy a Didgeridoo? How do I change my password & user account details? You can change your password and account details on the My Account page – click here to access it. An internet connection fast enough to support streaming video – you’ll need a connection that has a speed of at least 1 megabit per second and is low latency link. Some 3g broadband solutions, satellite & some types of wireless connections don’t satisfy this requirement and may get intermittent dropouts in video. For those techie people that are interested, Didge Dojo content is currently delivered from 3 different data centres, 2 in North America and 1 in Europe. The videos should work on Ipad, Iphone, Android and other mobile devices capable of HTML5/H264 video support. Note that these devices will need to have a fast enough internet connection to support streaming video. If you’re using Didgeridoo Dojo on a PC you’ll need the latest version of Adobe Flash. Click here to update your version. Didgeridoo Dojo is compatible with all current web browsers for Mac, PC and mobile devices. You’ll need an up to date web browser – we recommend Google Chrome or Mozilla Firefox as our preferred web browser applications. If you’re running Internet Explorer, you’ll need to be running at least Internet Explorer 8 to support Didgeridoo Dojo. You’ll notice that the comments system throughout the site is powered by Facebook. We’ve made the decision to run with Facebook comments to reduce the level of administration the comment system requires – to post a comment you will need a Facebook account or a third party account that the Facebook comments system supports. I signed up for the 30-day course but am not getting the emails! Once you subscribe the system will send you an email where you need to click the link to confirm your subscription to the course (called a double-optin). I just signed up for a paid account, how do I logon? Alternatively, try using the Forgot Password function on the Logon page or if that still doesn’t work send us a support request through the Contact Us page. I have a lifetime subscription but can’t see “Save As” when I right-click on the download link, how do I fix this? This is a common problem with Internet Explorer browser when the security settings are turned up too high or where your antivirus software is being overly aggressive. If you’re fairly tech-savvy then dialling down the security settings should resolve the problem. If you’re not that technically inclined, the quickest way to solve the problem is to use another browser to access the site. Both Google Chrome and Mozilla Firefox browsers are alternatives to Internet Explorer that will solve the problem for you – if you download and install one of these browsers to access the site you’ll be able to download the lessons without a problem. Do you have DVDs or CDs? Currently Didgeridoo Dojo content is not available to purchase on CD or DVD BUT we do have CD Audio, MP3 and DVDs available at Didgeridoo Breath. Our Playing the Didgeridoo Audio series created by Matt & Tony is also available on iTunes.